The online video industry is a boys' club, but that hasn't stopped some women from rising to the chief executive position. Here's what three of them say about hidden obstacles, acceptance for women in tech, and what they'd like to change. IN THIS ISSUE: the Summer 2016 European Sourcebook edition is now available. Make sure you see your copy in future – SUBSCRIBE FREE HERE! Is Virtual Reality Streaming Ready for Prime Time? ATTENTION VENDORS! Thousands of new customers are waiting to meet you in Streaming Media magazine's European edition. 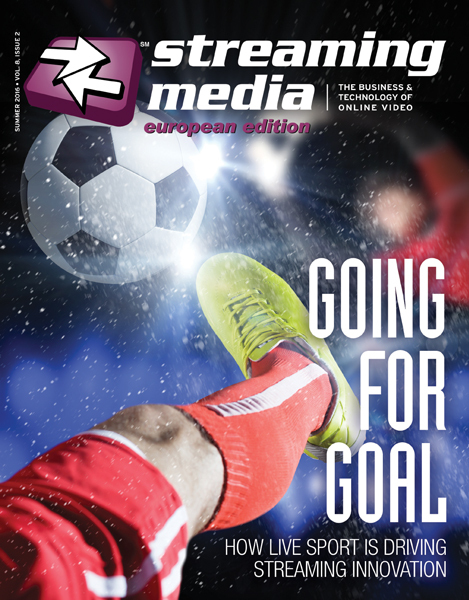 Get your company in front of the European readership of Streaming Media magazine. Published four times a year, the European edition is loaded with news, comment, features, tutorials, and reviews that help content producers and publishers make wise business decisions and maximise online video ROI all year. Put Streaming Media's European magazine in your 2016/17 advertising budget – read more about reaching thousands of new customers here. Piracy isn't just a problem for Hollywood — anyone producing valuable or sensitive video from online learning courses to corporate training videos stands to lose money, face or trade secrets when their assets show up on torrent sites or elsewhere, unintended. Watermarking has long been viewed as the best protection against theft, but not all methods are created equal. This free white paper provides a comparison of leading methods, from overlays to forensic, breaking down where each falls on the spectrum of cost, security and ease of use. It also provides a sneak peek at new methods, such as on-demand watermarking, which can deliver a 90-minute feature film with personally identifiable, non-removable visible watermarks, in just seconds. Learn from the experts with these tips provided by live streaming veterans. We guarantee you'll learn at least one new thing that makes your next event a success, regardless of if you're streaming live or recording for video on demand (VOD). From choosing the right camera settings to making sure your event is recorded for seamless post-production, this white paper sets you up for a successful live production in any environment. Download this white paper and get started on your next successful live production today! As video service providers roll out new apps, services, and UIs across more devices than ever, content delivery continues to expand beyond the set-top box. Thus, video service providers are now tasked with understanding how these new solutions affect viewer engagement and how to best optimize the user experience. Additionally, these new video service offerings drive an unprecedented amount of useful, personalized data. Accessing this data isn’t the challenge, but extracting meaningful signals from this wealth of data to derive Key Performance Indicators (KPIs) that truly align with the video service provider’s goals can be difficult. – The top KPIs all video service providers should be tracking. – How to set baseline KPIs. – Best practices on how to overcome the complexities that content discovery functionality can add to data analysis. – How to leverage data from these KPIs to enable data-driven optimization of a viewing experience. Success in the OTT market requires more than just offering the largest array of content; it requires providing a superior quality of experience, across devices, every time. From content discovery to socialization and engagement, OTT providers must deliver a superior quality user experience in order to keep subscribers happy and away from the competition. Download OTT 2.0: How to Build a Better Mousetrap white paper today to learn more! Don't lose your audience to content buffering, stalling, or just plain not working. Learn how use active 24/7 monitoring for instant, detailed alerts of streaming issues before they become your viewers' issues. Read this free whitepaper for valuable insights on how a comprehensive active streaming monitoring service will ensure your live streams are performing at their best. As an operator of a streaming service, understanding at some level how video gets streamed to a customer, and also how a customer accesses video streams, is critical. When an operator knows where their company or organization fits in the streaming landscape, making informed decisions becomes much easier. In this paper, we discuss what to consider when launching a streaming service, and provide important questions that operators should ask themselves and their potential vendors. Live event streaming is on fire, but with so many moving parts, you need in-depth guidance on planning, workflow, and execution. This Superguide is designed as the ultimate 2016 reference for how to professionally stream a live event, featuring some of the best companies that make it happen. Streaming Media Europe is always looking for quality articles and editorial submissions from our site visitors. This is your community and you have the chance to influence it. In order to keep the Streaming Media website updated with fresh content, the support of community members is crucial. If you are interested in submitting an article or editorial, please read our writer guidelines and contact us. Got News or an article to submit? Click Here. Interested in Online Lead Generation Programs? Copyright © 2016 Streaming Media, a division of Information Today, Inc. Looking to offer AVOD, TVOD, SVOD or Paywall? Or a combination of all four? Powered by Ooyala, Telstra’s Video Monetisation Solution harnesses the power of the cloud, award-winning analytics, and then translates them into actionable insights. Combine that with over two decades of broadcast and digital media experience and you have the right partner for success. As summer begins, StreamingMedia.com looks at the content, monetization, and workplace challenges that face the industry. The more things change, the more they stay the same. The support for a common format enables operators and content owners to deliver OTT TV streaming across many applications and devices. Getting complaints related to buffering on your streams? Buffering presents a real business risk that can lead to viewer abandonment. Do you have a strategy for delivering live video to viewers with all types of internet connections?